If you ever visit a private school you will often see a noticeable difference in the food and healthcare provided for the children. Although there’s been a lot of pressure put on in recent years to increase the quality of school dinners across all schools, there is often a greater increase in private schools due to their extra funding. Parents that pay a large amount of money for their child to attend school are going to expect to be able to see the results of that funding in both the standard of education and the quality of facilities offered. That is why the quality of medical facilities is often better in private schools as well. School dinners were introduced in the UK in the 1870s in order to combat the high levels of malnutrition among children in poor areas. 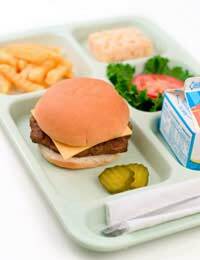 Things have changed a lot since then and the quality of school meals has increased a lot over the past few years especially, along with the growing awareness of health issues and the importance of a healthy diet. Whether school dinner is included in your school fees or not, you will probably notice that the quality of food is generally slightly better at private schools. Although like most schools, food is often provided by a private catering company, private schools can afford to spend a little extra. However, this does not always necessarily mean that they will, so it's always a good idea to enquire about and possibly even try the food a school has to offer before enrolling your child. If your child is hungry during break times, most schools have snack machines available to use as well. You may find that many private schools have slightly better on site medical facilities, and they may employ one or two more nurses than you might find in a state school. Some schools even have separate purpose built medical units, with staff that are on call 24 hours a day in many boarding schools. The exact medical facilities will vary from school to school, so if your child has any specific medical requirements it’s always a good idea to arrange to meet the medical staff to have a chat about what the school can offer. Most schools like to try and teach their pupils the importance of physical fitness and health and private schools are no exception. It’s recommended that schools give their children at least 2 hours of PE a week during years 7, 8 and 9 and at least one hour a week during years 10 and 11. One of the benefits of your child attending private school is the range of facilities on offer. Whether it’s a swimming pool, sports fields, courts or a gym, private schools are able to put their extra funding to good use when it comes to sport and fitness. These facilities also make joining teams and taking part in extra-curricular exercise a lot more appealing too.